So after saying that is this post just an inside joke and he's a friend of yours? 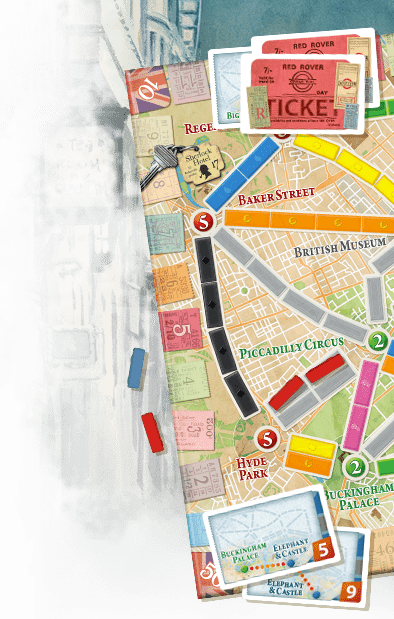 Peter, it is absolutely disgraceful that you are making public jokes in this community forum - what do you think Ticket to Ride is, some kind of game? LOL light up the newbie everyone! I thought I might actually learn something about the game on this community forum, now I see it's just a gathering place for the 'elite' TtR nerds to make attempts at being witty (and clearly spending too much time doing so) and giving each other slaps on the back to make themselves feel good while apparently forgetting the platform for this worthless activity is the communnity forum of the online version of a board game! Thank you for proving what I originally thought, that I don't belong in this 'cool' group (praise Allah)! Well, I have been called a nerd before, but never 'elite'...the first may be correct, the second most definitely not. And I have never been accused of being part of a 'cool group' before. To make up for such mis-characterization, I hereby challenge you to a trans-national railway battle the next time we are both on line! I accept! I'm not too proud to admit I may lose to a nerd. Let's settle this like men, on the railway tracks. Wow Peter & blubes, I have a similar story but with mine it is the 6 blue Aleo always takes. And it is obvious I have the Port-Phoe ticket, yet he takes the BLUE because he has the other Portland ticket or a Seattle ticket or Vancouver or Calgary or Chicago, or a combination of all of them, as it is Aleo who seems to always end with 5 or more tickets. We will have to ask him what he thinks Fair Play means. If you are in a 4er or in a 5er with Will, beware ! You will be quite likely to block him and target him on purpose in order to tank his multi ranking ! (182nd yesterday). I'll personally watch any of you playing with Will in multi and will consider you responsible for the pm's Will sends me about his multi ranking ! Good. Tell your stories. Voice your pain. The only way to root out this disgraceful behavior, is to publicly hang the cheaters. You are not the only victim. There are people out there just like you. Now let's all join hands and sing 'Kumbaya'. That's for being gullible and calling me a nerd. 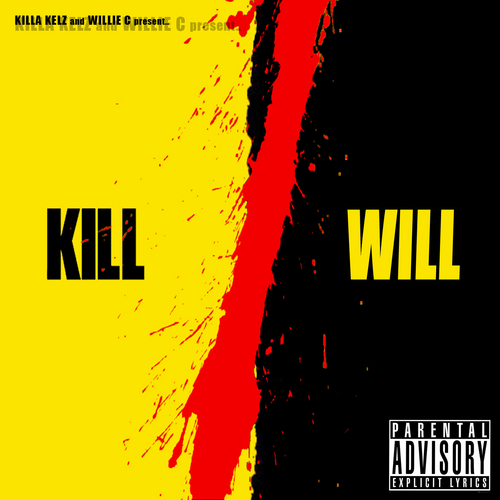 Sysyphus, I'm joining the 'Kill Will' movement. Just... I don't know. No apparent reason really. I'm happy to announce I taught Denito a lesson. I know all my fellow tops were a bit concerned with this player invading our precious forum, but I took care of it (as always). It's important to keep players like this away from our forum. We're trying to keep it civil and professional and these types just ruin it for all of us, questioning our integrity. Excuse me? WHO are you? It doesn't matter who you are! n00b! I do have two questions however. And, second... take a look at this screen shot... I just noticed there is a comment section. But... what is it for? And how do we use it? I sure hope this wasn't another n00b question... I've only been playing this game since 2005! Alright, happy I could help you guys out again. If you play wdellis1 and a bot is coming, perhaps he just thought the game was lost for him, and jumped in another game...like this morning (playing with bry guy while I'm writing) ! So you can end and win the game. My daughter said, "Daddy, what does stereotyping mean?" and I said "Give me a moment to find you a real-life example". Thank for helping me out, Peter! I just entered a game against bry guy. I had SSM-nash and den-pitt, he had 3 tixs and started with 6 black, 6 red and 2 in hou. So I tried a block...and lost the game. When I wanted a re, Bry Guy kicked me out and said : "I just want to play a regular game"
The farm needs people to come weed. Oh...that's not the type of warning you all meant for this thread? in the future i will finish my games vs bots if my opponent like to leave the game after a block,because i finish to fast or they leave at the begin when the see some bad tickets!!! finish with be nice and leave the games also!! GRATS wdellis1 GREAT WORK VERSUS THE BOT!!! "I'm happy to announce I taught Denito a lesson. I know all my fellow tops were a bit concerned with this player invading our precious forum, but I took care of it as always)." Order restored - but chaos ensues. Let it be known Peter the Great has been tamed. His feeble attempt at silencing me has only led me to beat him down on the board. As Weird Al once said, our friend here suffered from 'delusions of adequacy'. For someone thousands of places ahead of me in the rankings I thought he would have enjoyed 'teaching me another lesson', and though he did teach me a lesson, I'm sure it wasn't the one he intended. Peter you are officially a hack! All the smack talk in the world will never restore your pride. Dude, you knew exactly what tickets I had and STILL could do nothing about it. Don't worry though, I'll allow you to rematch me anytime - I also know what it feels like to be Hogan leg-dropped. Not only am I invading your precious forum, now I'm invading your space among the T2R elite. Dude, you knew exactly what tickets I had and STILL could do nothing about it. Vancouver-Montréal and Portland-Nashville, yes. You made that perfectly clear in the first two moves. But it's kinda hard to block when you are the one with all the locos. Dear Days of Wonder, I thought 'personal attacks' were not allowed on this forum? Could you please ban this player? Oh Peter why you will have banned Denito?! at last i try to write in english but man with the big mouth if you can write perfect in german or maybe italien lets speak about faults in a language that you never learned in school!! Given a 200+ point spread in your rankings....I think it can be stated without fear of contradiction that you (and I for that matter) don't know nearly everything Jen knows about this game! it's pretty simple after all. Actually....it's not all that simple or you (and I) would have a lot better rankings than we do! I would like to defend myself (Wdellis1/route_66). I'm actually pretty new to this game. When I started playing I wasn't very good and I happened to have a very poor internet connection. There was a long period of time when I lost A LOT of games playing average players like myself because I lost my internet connection during the game and the other player finished against a bot. I was never mad at the other player, I just figured it was my fault for having a bad internet connection. Anyway, over the last few months I have learned from playing better players like yourselves and have gotten better at this game. However, I didn't realize that what was normal for below average players (playing against bots) was considered rude and unsportsmanlike by better players like yourselves. thanks for playing vs a bot!!!!! sorry but i dont believe you. and yes i posted in the "warning" thread right after seeing another user saying u played vs a bot. my language was not offensive. that behavior is A$$ behavior. simple fact. i was close to win, why should i?! and why do you change your name, once you appear on the blacklist? and how does it come, that other players make same experiences with you? So to those of you who are reading this, especially you Hecki, Miguel, and MUDDA, I will let you decide what to think of this. I would appreciate you all allowing me to continue to play with you and you can know that I will not play a bot if you are kicked for some reason or other. Since becoming aware of this rule I have purposely abandoned games that I thought I would have won because the other player was kicked and I appreciate some of my recent opponents doing the same for me (most recently an-team and mef 23 both did this for me). 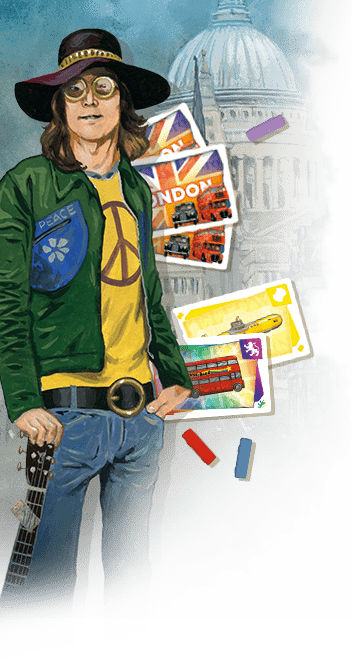 I look forward to friendly ticket to ride games in the future. 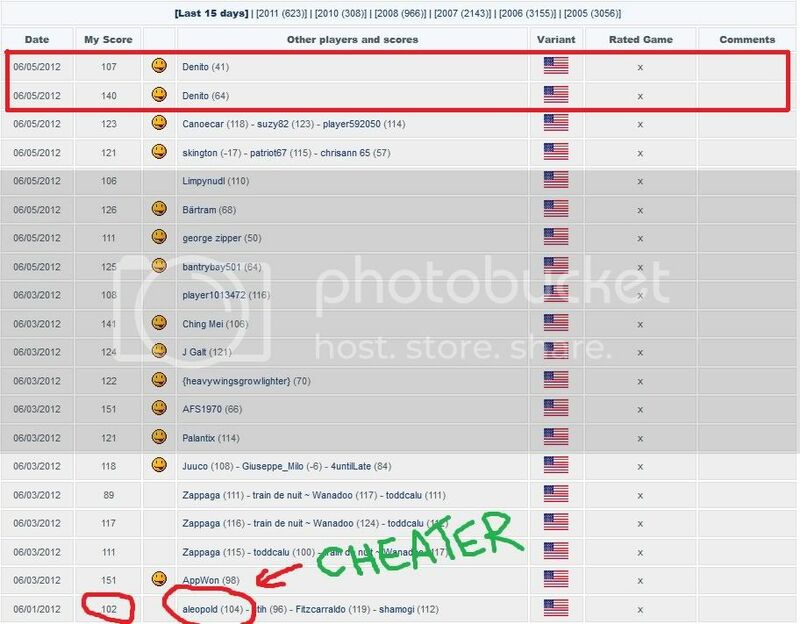 Best is that Route 66 is also a cheater ! Onyx and ommie can share the story as well ! All ingredients united to be part of our hall of shame ! one of many! at least i called him an A**! leaves games and joins other ones without any notice. Dragonrouge. I just happen to have 42 and his first 4 turns are to block off mont and ny, open taking locos after 2 turns to lay 5 black cheat. Computer had crashed twice, and both these guys continued to play against the bots. I'm generally one for kicking bad people where it hurts, but I have to agree with Elric here. Mostly because Max probably did what the situation dictated. What's with the bot obsession here anyway ? Cheating, second account shenanigans (how's my spelling ? ), excessive swearing at an opponent, sure. Flame em, I say. Leaving a game and showing up in another, I'd like to hear about that one. But playing on against a bot in general ? It's etiquette between top 200 / tournament players to wait. I personally think it's etiquette not to talk BS during a serious 2P game. It's your own responsibility to have a good internet connection in the first place. Do you want me to write in the "WARNING" thread that you botted twice during the game, making me wait for you and your crappy connection ? Stop using wifi, format C: and re-install your operating system. I will certainly play on vs. a bot if I'm playing some obscure player who leaves after seeing their cards or after being blocked, just to keep the order of the universe in tact.